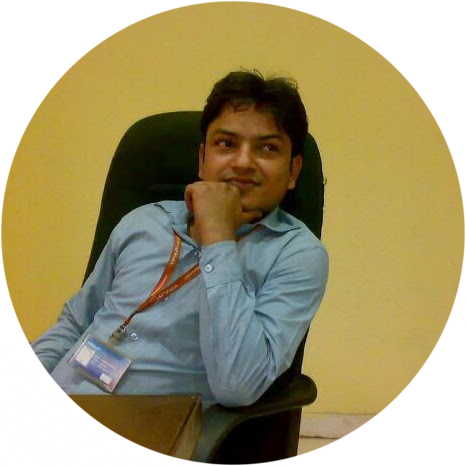 We were discussing the “Elongation of uniformly tapering circular rod” and “Elongation of uniformly tapering rectangular rod” and also we have seen “Stress analysis of bars of composite sections” and “Stress analysis of bars of varying sections” with the help of previous posts. Now we are going further to start our discussion to understand the concept of “Thermal stress in composite bar”, in subject of strength of material, with the help of this post. We have already discussed the basics of thermal stress and strain and we will use that concept here too. First we will understand here, what is a composite bar? Composite bar is basically defined as the bar made by two or more than two bars of similar length but different materials and rigidly fixed with each other in such a way that it behaves as one unit and strain together against external load i.e. it behaves as single unit for compression and extension against compressive and tensile load. 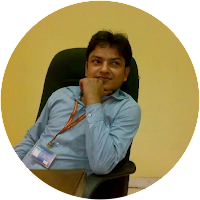 We can say here from the definition of composite bar that strains will be same for each bar of composite bar and hence actual change in length will be similar for each bar or we can say that actual strain will be same for each bar of composite bar and we will use this concept during thermal stress analysis for composite bars. Let us consider that we have one composite bar consisting two bars of different materials i.e. one bar of brass and other bar of steel and it is displayed here in following figure. Let us assume that we are now going to heat the composite bars up to some temperature, so what will be expected to occur? As we know that if we are going to heat any material, there will be increase in temperature of the material and hence there will be increase in dimensions of the material. Similarly if we are going to cool the material, there will be decrease in temperature of the material and hence there will be decrease in dimensions of the material. We can simply say that there will be free expansion or free contraction in the material according to the rising or lowering of temperature of the material. If free expansion or free contraction of the material due to change in temperature is restricted partially or completely, there will be stress induced in the material and this stress will be termed as thermal stress. We must note it here that if free expansion or free contraction of the material due to change in temperature is not restricted i.e. expansion or contraction of the material is allowed, there will no stress developed in the material. 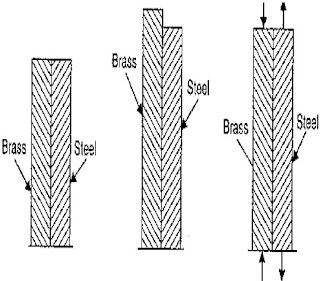 Now suppose if brass and steel both are not in composite in nature and we want figuring out the change in dimensions separately for steel and brass due to change in temperature, we will be able to say easily that change in length of the brass bar will be more than the change in length of the steel bar for similar rise in temperature of the bar and this is basically due to different co-efficient of linear expansion i.e. α for brass and steel. Co-efficient of linear expansion i.e. 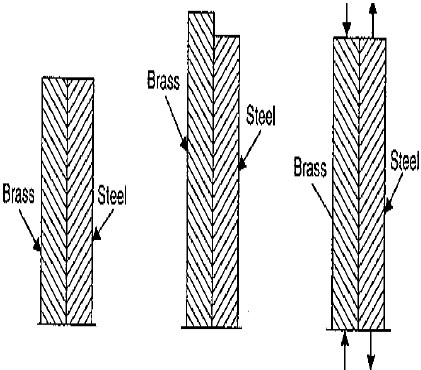 α for brass will be more than as compared to steel and therefore change in length of the brass bar will be more than the change in length of the steel bar for similar rise in temperature of the bar. But in this situation, brass and steel are in composite state and therefore both members of composite bars will not be able to expand freely. Hence the expansion of the composite bar, as a whole, will be less than that for brass but more than that for steel. We must have to note it here that brass will be subjected with compressive load or compressive stress because steel will restrict the brass to expand up to the limit up to which brass could be expanded. And similarly, steel will be subjected with tensile load or tensile stress because brass will force the steel to expand beyond the limit up to which steel could be expanded. In simple words, we can say that both members of composite bars will be under stress but one will be in tensile stress and other will be in compressive stress i.e. steel will be under tensile stress and brass will be under compressive stress. We will see another important topic, in the category of strength of material, in our next post.